Casa Vinyasa is open all year around and Closed on New & Full Moons and National Holidays. FOR TEACHER DETAILS CLICK ON EACH INDIVIDUAL CLASS ABOVE. FIXED WEEKLY SCHEDULE LISTED BELOW. “Mysore Style” is the traditional way in which Ashtanga yoga is taught, where each student practices at their own pace within a group setting. New students are introduced to the Ashtanga sequence of asanas (postures) and progressively add new asanas as their practice evolves. Teachers move from student to student offering personalized guidance and adjustments so that each student can focus on their breath and personal rhythm to best deepen the quality of their practice. How should I prepare for my first practice? Reserve about 1.5 hrs so you can arrive, change, enjoy your practice and have a moment to speak with one of our teachers following your practice. When you arrive, the Mysore style class will likely be going on. Please remove your shoes at the door and enter the shala to present yourselft to the teacher who will help you find the dressing room and begin guiding you in your practice. Wear light, comfortable clothes to move in and be prepared to sweat. Feel free to bring a change of clothes and a towel if you’d like to change or shower or at the school. If you plan on showering, please bring your own shower products, keep showers quick to conserve water and allow time for other students, and help us keep the changing room and shower areas clean. Avoid eating too much beofre your practice. It’s best to practice on an empty or light stomach. Bring a yoga mat if you have one. If not, you are welcome to borrow one from Casa Vinyasa for your first few classes. And please remembeer to TURN OFF or SILENCE your cell phones while at Casa Vinyasa so they do not disturb other students. What if I have never practiced yoga before? Not a problem at all. 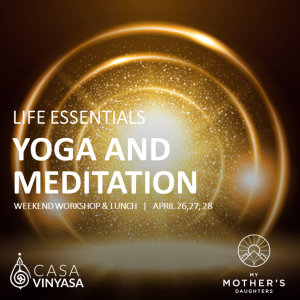 You do not need to have any prior experience with yoga to practice at Casa Vinyasa. The way traditional Ashtanga works is that each student will practice only the asanas (postures) right for their current experience level. The practice can be adapted to any level of strength and flexibility and as the student progresses, improving the quality of their breath along with their movement, additional postures and subtle layers of the practice will be added. If you have your own yoga mat, yes, please bring it along. If not, you are welcome to borrow at mat for your first few practices. This is a dynamic form of yoga where you will be in continuous movement, so it’s best to wear something light and flexible to stay cool and comfortable. It is common to sweat, as well, so some students like to have a small cloth by their side. Is it safe for me to practice if I have an injury? If you have any current or persistent past injuries, please let the teacher know before beginning your practice. There are many ways to adapt the practice in order to protect the healing process and avoid further aggrevation. If you have any doubt or questions please to not hesitate to speak directly with a teacher to clarify. What are the price options? We have several options to fit your schedule and budget. You can choose from annual, semester, tri-mester, or monthly memberships for either full-time (unlimited attendance for full schdule) or part-time (allowing you to join 2-3 times / week). There are also 5-class and 10-class packs, perfect for visitors. A single drop-in class is 15€. For full pricing details you can get in touch with us at info@casavinyasa.com or call us at +351 912 171 778.